To close out the month, I have 2 quick page gifts for you. One is for celebrating a special graduation, and one is just right for summer and the 4th of July! Both are free through July 7 at MyMemories! Just a reminder that you must have an account to download freebies at My Memories. It is not necessary that you have or use their software! When you download, simply choose the GENERAL option and your download will be standard JPG and PNG files for use in your scrapbooking program of choice!! Here are the $2 Tuesday Sales from my awesome designers this week!! First up, Connie Prince! Discovery Zone is only available as a page kit, there are no additional packs for this one, ladies. You can see the kit here on Gotta Pixel. College Bound has additional packs! As always, the kit is $2 and the additional packs are $1 each. Super time to build your collection. See the kit here on Gotta Pixel. Kathryn Estry is offering her La Famille Tuesday only. La Famille is kit you could use to scrap just about anything. The name says it's about family, and isn't that what we usually scrap? The kit is $2 this Tuesday, June 30, and the extra packs, are each $1 Tuesday only. You'll find these sets at Gotta Pixel and MyMemories. This week you can pick up my Tangerine Grunge Page Kit and Alphabet for just $2 each from Kristmess Designs! This collection is great for many types of layouts with great colours and styles for both masculine and feminine pages. Check out the entire Tangerine Grunge Collection, everything else is 25% off! Just a reminder that today, June 30th, it the FINAL day of Connie's June retiring sale! When these products are gone, they are gone forever!! 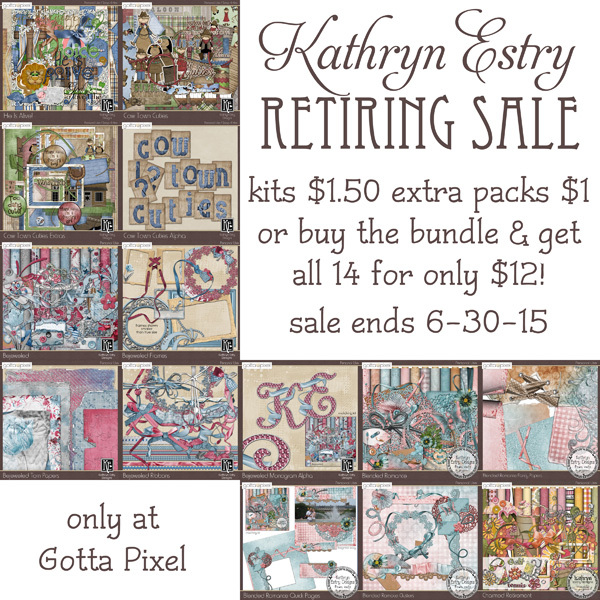 Kathryn Estry also has some retiring products. Last day of Sale - June 30th!! Silvia Romeo has these two kits for $2 each at Gotta Pixel only! Silvia Romeo kits for $2 Tuesday Sale this week are A Vintage Delight and Boulevard des Arts. Both are beautiful full sized kits. Enjoy!!! Remember - all prices are for Tuesday, June 30, 2015 only!! Looks like I only have Sneak Peek for you this week! One of the things I love most about Connie's kits are the vibrant, primary colors. And this kit does not disappoint!! Looks like this might even be the Project July kit!! Want to enter? Leave your comment in this thread on Gotta Pixel by 10 PM Eastern on June 24th for your chance to enter!! It's that time of the week again! I missed some time again. Had another series of nerve blocks. Crossing my fingers they help! I was doing great until I decided the floor needed a hug back in April. So.. on the sales. First up, Connie Prince! Fabulous Fall is one of my favorites! The best thing about Connie's sales - the kits are $2 each. And all of the additional packs are a mere $1 each! So you can build your custom collections and save! Moving on to Kathryn Estry.... Le Petit Cafe. One day only at both Gotta Pixel and My Memories. The kit is $2 and all coordinating packs are $1 each. We have a Sneak Peek from Kathryn Estry for this week's upcoming GGI release at Gotta Pixel. There will be 8 sets in the collection. On lucky person will win all 8 sets!! Simply post a comment in this thread on Gotta Pixel for your chance to win. All comments must be placed by Friday, June 12, 2015 at 9 PM ET. I do have a couple of sneak peeks for you today. First one up from Connie Prince. Looks like this week might be the Monthly Template Bundle. What do you all think? All comments must be placed in this thread on Gotta Pixel. Be sure to comment by 10 PM this evening, June 10, 2015. I'll be stopping by to run the randomizer shortly after that and one lucky ducky will win the templates! Not such a bit rush to comment on this sneak peek from Kristmess Designs. One lucky person will the 2 paper packs and 2 elements packs! All you have to do is post in this thread at Gotta Pixel. Terry will be back on Saturday morning and run that randomizer for the winner. BUT.. everyone who comments will receive a $1 off $5 purchase from Kristmess' store. Connie Prince is also having a Sneak Peek for her upcoming GGI release this Saturday. Stop by this thread on Gotta Pixel and leave your comment for a chance to win!! Be sure to comment by Saturday, June 13th at 9 AM. I can't believe it's already Tuesday again! Which means $2 Tuesday Sale time is here! Lots of $2 sales today. Starting with Silvia Romeo Designs, we have two awesome offerings. Gaiety and the Gaiety Album. Gaiety is a happy and cheerful kit. Casual, although still sophisticated, with a feminine flavor all over, Gaiety has beautiful textures, lovely colors and detailed elements and papers. This kit was created to dress your pages in great design, and is versatile enough to suit all kinds of layouts. Image is linked to the store. These pages, created using the beautiful Gaiety Kit are a great acquisition. You will have a full Album in no time! You can also buy the complete kit and add many more pages, created by yourself, to your Album. Can you believe 8 Quick Pages for only $2???? Image is linked to the store. Moving on to Alessandra Designs ( who I have been very remiss in adding to my blog page! )....Alessandra is offering an album for $2 Tuesday. 8 Quick Pages for $2!! You'll have a completed album in no time with these. Image is linked to the store. Moving on to Connie Prince. We have 2 kits on sale this week!! I Love School and My Gift. Remember that the additional packs are just $1 each, so it's a great time to build your collection. Kathryn Estry is offering two kits for two days! June 9th and June 10th! The page kit is available at Gotta Pixel, GingerScraps, and MyMemories. You'll find the glitter alpha at Gotta Pixel and MyMemories. Kristmess Designs $2 Tuesday sale included a bright and summery kit, Lemon Squeezy Page Kit and Alpha. Each kit is $2. The rest of the collection is 25% off! The Lemon Squeezy Page Kit is available here on Gotta Pixel. The Lemon Squeezy Alphabet is available here on Gotta Pixel. Time for a new Share The Memories Program update! These freebies are available June 8th through June 14th. Remember: You MUST have an account at My Memories in order to download the freebies. However, you do NOT have to use their software. You can opt for a general download and that is your stand psd files. So you can use with any of the common scrapping programs! These two kits are available at Ginger Scraps, Gotta Pixel and The Digi Chick for the $2 price per kit with additional add on packs at $1 each. Link provided for Gotta Pixel store. Sale pricing is also available on GingerScraps and The Digi Chick. Silvia Romeo is offering her Rainbow Bridge Kit and Quick Page for $2 each at Gotta Pixel only. I have linked the image to Silvia's blog post for more information and links to the store. Kristmess Designs is offering her Home Grown Page Kit and Alpha for $2 each only at Gotta Pixel. The rest of that collection is available at a discount of 25%. The image is linked to the Gotta Pixel store. PrelestnayaP Designs is offering the Summer Bouquet Kit and the Summer Bouquet Clusters and Wordart kit for $2.00 each. These images are linked to the Gotta Pixel store.